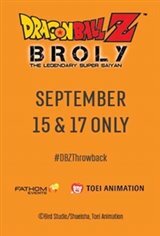 Fathom Events and Toei Animation bring the full remastered English dub of Broly: The Legendary Super Saiyan, to movie theaters on September 15 and 20. In addition to the feature, audiences will view bonus content and receive an exclusive trading card (while supplies last, quantities are limited)! Broly - a powerful Saiyan warrior with an unspeakable evil streak - has Goku, Vegeta, and friends squarely in his sights! Now, a race to save the universe turns into a test of survival skills for Earth's mightiest warriors. Prepare for the most intense Saiyan battle in history: a clash for the ages rooted in the pains of the past.